A very Happy and Freilachen Chanukah to everyone. Please enjoy our new single for Chanukah entitled “Happy Chanukah!” (Style). Can you guess what it’s a parody of? This song is a .99 cent download which is available on Mostly Music and will BH be available shortly on itunes. Please help us in our efforts to help support the JM in the AM Hurricaine Sandy Relief Fund. For more information on this ongoing effort as well as additional A.K.A. Pella news, please go to akapella.net, visit our Facebook page or go to https://www.wfmu.org/marathon/jmintro.shtml for info on how you too, can help pitch in. So, are you one of the 895 million people (and counting)who has seen the “Gangnam Style” video? No??? Well then this contest might not be for you. (We’re just kidding, you can still participate). As you can see(and hear) A.K.A. Pella has now released a single for Chanukah entitled “Happy Chaunkah!”(style), a lively parody of that ubiquitous hit and worldwide craze which has led to countless parodies, goofy videos, and what seems to be everyone and their grandmother getting in on the fun. To help get into the Holiday spirit and to truly experience the song, we encourage our fans to go out and create your own video. Do you have a funny parrot or pet cockatoo that loves to dance to inspiring Jewish lyrics? Perhaps you’ve had or will soon be having a Chanukah party/shindig and might have some funny or cute footage that you can set to the song? Have you suddenly been tickled with the urge to create a flashmob? Whatever your motivation, go ahead, be inspired and create your own Happy Chanukah! (Style) Video. Entering is simple. Just go to our FB page, like us, upload your video and post the link to our page. (Post on your page as well). 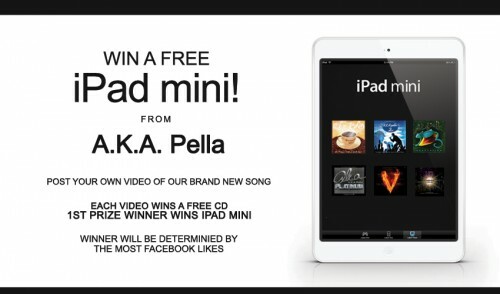 The person who submits the video which receives the most “likes” wins an ipad mini! Everyone in your video will also receive a free CD. So go ahead, show us what you got! Please remember to keep it kosher and most of all have fun! NOW YOU GET OVER HERE WHAT ARE YOU DOING WITH THAT SAYFER?